As I read on, I found myself reading and rereading pages where Nora reappeared as I imagined myself in the conferring seat beside them. I am struck by the idea that we can only put readers front & center if we intentionally seek those ‘exhilarating moments’ and bring them to life in spite of the system cracks. 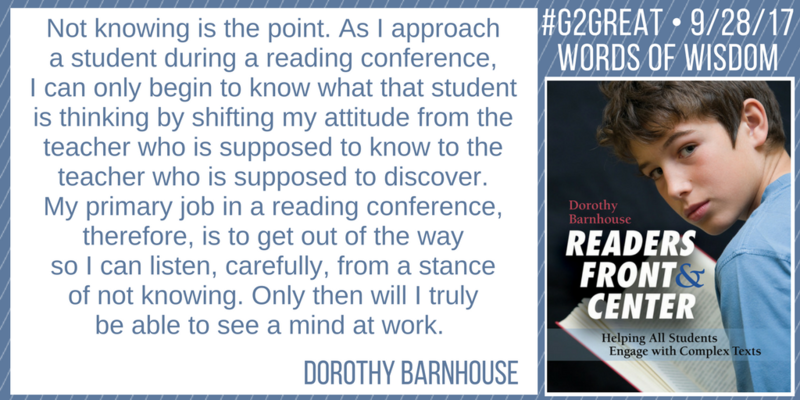 Motivated by my desire to capture this idea in writing, I began perusing her words in a glorious hour of conferring with Dorothy #G2Great twitter style. Dorothy’s challenge asks us to sharpen our vision for what is possible with our students – the very possible she so eloquently describes in page after page in her book. I love the dual purpose of this challenge in that we cannot possibly make this shift for our students unless we are willing make this shift for ourselves in the form of professional responsibility to students by virtue of our day-to-day instructional actions. This dual shift allows us to create professional stepping stones that will alter the very way we approach instruction – and thus change the trajectory of success for us both. And so in honor of an enthusiastic exploration to ponder how we can make this shift, I’d like to share five ‘exhilarating moments’ that will keep all of the Nora’s of the world front & center as we work relentlessly to support our shared journey side-by-side with students as they work with complex texts. 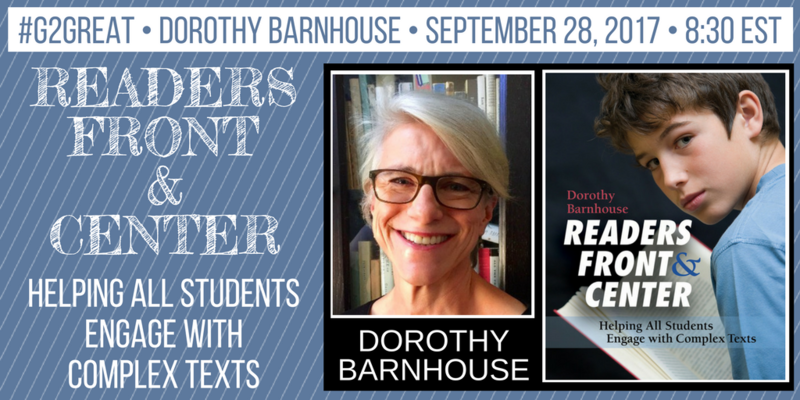 Dorothy reminds us to keep our students at the center of all we do as we celebrate their identity as a reader first and foremost. I have long been concerned that many districts make the questionable decision to initiate formal assessments at the beginning of the year. I can’t help but wonder why we would want numerical assessments in our hands before we know the child behind the number. In order to keep children at the center of all we do, we must begin by exploring who our students are as readers before we allow those assessments to cloud our view of their emerging identity. In Dorothy’s book she asks us to “notice smarter,” a point highlighted in her reminder to become expert kidwatchers. These precious opportunities afford us the time to be quietly present in student learning moments so that we can notice what they do as they actively engage in literacy work. Those quiet moments allow us to name what we see and hear so that we can make our noticings public within literacy conversations with children in order to make the thinking work they do in the course of learning visible. Dorothy’s intentional use of the word ‘research conferences reminds us that within these rich literacy conversations reside the data that will drive our instructional efforts. One of the most powerful aspects of conferring is that we are able to make in-the-moment decisions as we listen intently to what our students do or struggle to do. Dorothy celebrates the potential of not knowing as she recognizes that the best instructional agenda is often the agenda that only the child engaged in literacy work can share with us. In other words, they are making us privy to our next step moves in the heat of those literacy conversations. One of the myriad of problem with lesson plans and scripts is that they focus on the text by making preconceived instructional decisions for teacher without the benefit of knowing the students in front of us. This contradicts the idea that the text is only the vehicle but it is the child and the thinking they engage in during the experience that demands our attention. This priority mismatch distinguishes instruction as a process of doing vs. instruction as a thoughtful student-centered process that begins with the reader. This means that we are less interested in what they do or struggle to do than we are with the thinking that occurs within those doing moments. A script blinds to here and now thinking moments and can even thwart our view of them. As adult readers, we know that there are many pathways to understanding and that we choose those pathways as we engage in reading work. If we acknowledge that this is the central role of reading, then we need to support our students in assuming that role as they do the heavy lifting beside us. By refuting the traditional view that we are looking for the right answer, we can be open to the flexible thinking that invites unexpected responses – thinking that can enrich the experience from both sides. When we create a positive and supportive experience for this thinking and allow students to engage in the messy process of problem solving beside us, we then begin to relinquish control of the very process that we engage in during reading. And within this process grounded in trust, our students begin to grow as readers. In order to celebrate who our students are as readers we must trust the books that they are choosing to use alongside us. I can’t think of a better way to bring their reader identity to life than the books that reflect their reading lives in the context of authentic day-to-day engagement as we hold both in high esteem. Thank you for this wonderful synthesis! I missed the chat for Back to Schiol Night and am so happy to feel like I didn’t miss it by scrolling through your post!